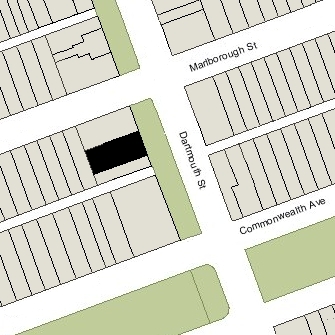 314 Dartmouth is located on the west side of Dartmouth, between Marlborough and Commonwealth, with 164 Marlborough to the north and 312 Dartmouth to the south. 314 Dartmouth was built in 1871 by building contractor George Wheatland, Jr. one of two contiguous houses (312-314 Dartmouth). Click here for an index to the deeds for 314 Dartmouth. When it was built, 314 Dartmouth had an angled bay extending from the ground level on the southern half of its façade. To the right of the bay was the entrance, up a flight of stairs, and to the right of the entrance was a slightly projected flat façade with windows, continuing up to a gable. Sometime before the early 1940s – and probably in the mid-1920s – the façade was remodeled to move the entrance into the squared bay, at street level, and square off the first story of the angled bay. A large oriel window was installed above the new entrance. Sometime after the late 1940s, this oriel was removed. 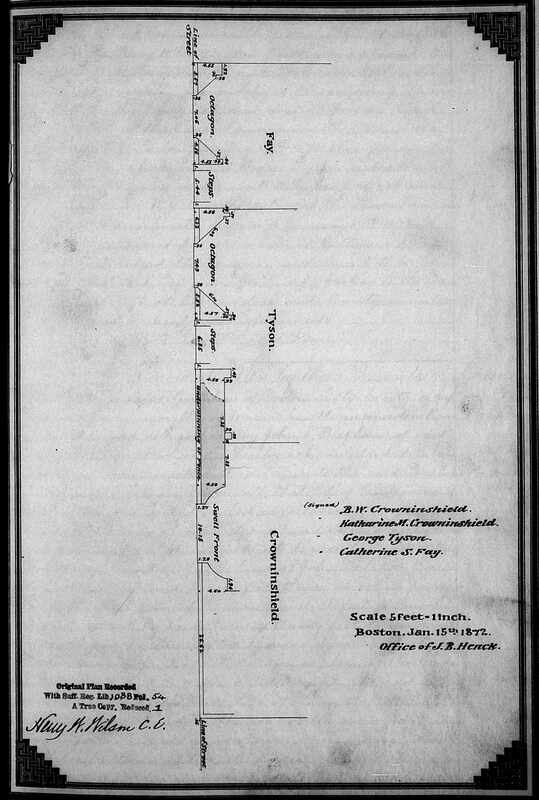 On January 1, 1872, 314 Dartmouth was purchased from George Wheatland, Jr., by George Tyson. He and his wife, Sarah (Anthony) Tyson, made it their home. They previously had lived at 232 Beacon. George Tyson was former partner in Russell and Company, the China merchant trading firm, and had spent much of the 1860s in Shanghai. He is credited with introducing steamboats on the Yangtze River. After returning to Boston, he retired from his partnership in Russell and Company and subsequently became a partner in J. M. Forbes Co. and also an official of the Chicago, Burlington and Quincy Railroad. Sarah Tyson died in February of 1873, and in 1875 George Tyson married again, to Emily Davis of Philadelphia. 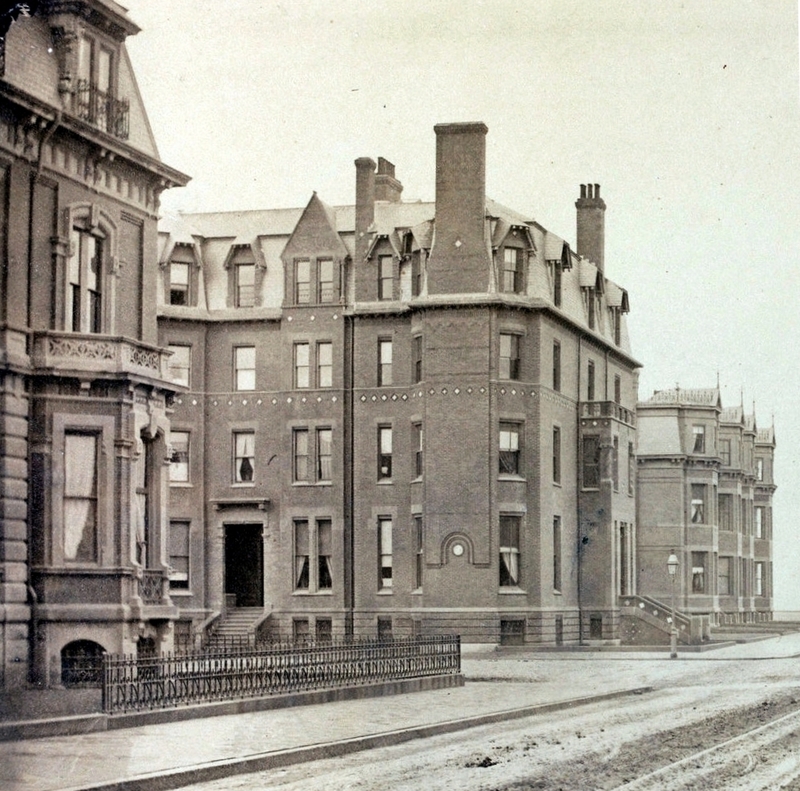 They continued to live at 314 Dartmouth with his three children from his first marriage: Russell, George, Jr., and Elizabeth (Elise) Russell Tyson. George Tyson died in January of 1881. Emily Tyson continued to live at 314 Dartmouth with her step-children. She also maintained a home in Prides Crossing, which she sold to Henry C. Frick (who tore it down). Russell Tyson married in June of 1891 to Sarah Merry Bradley. After their marriage, they lived in Milton and then in Chicago, where he was a real estate dealer. 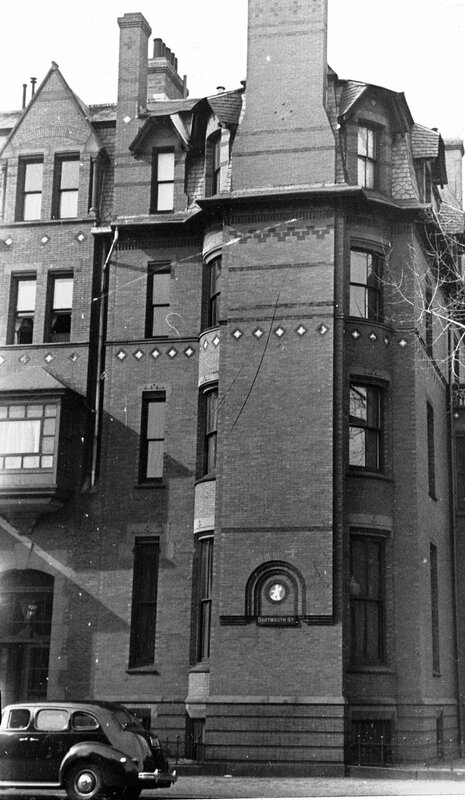 During the 1896-1897 winter season, the Tysons were living elsewhere and 314 Dartmouth was the home of James Hewitt Morgan and his wife, Martha (Leavitt) Morgan. They had recently returned from Paris, where he had studied architecture at the Ecole des Beaux Arts, and were in Boston with the intention of his entering Harvard Law School (which he ultimately did not do). By the next season, they had moved to 509 Beacon and Emily Tyson and her stepchildren were once again living at 314 Dartmouth. In 1898, Emily Tyson and her step-daughter, Elise, acquired Hamilton House in South Berwick, Maine, which they restored and made their summer home. Elise Tyson married in April of 1915 to Henry Goodwin Vaughan, an attorney (and fox hunting aficionado). After their marriage, they lived in Sherborn. 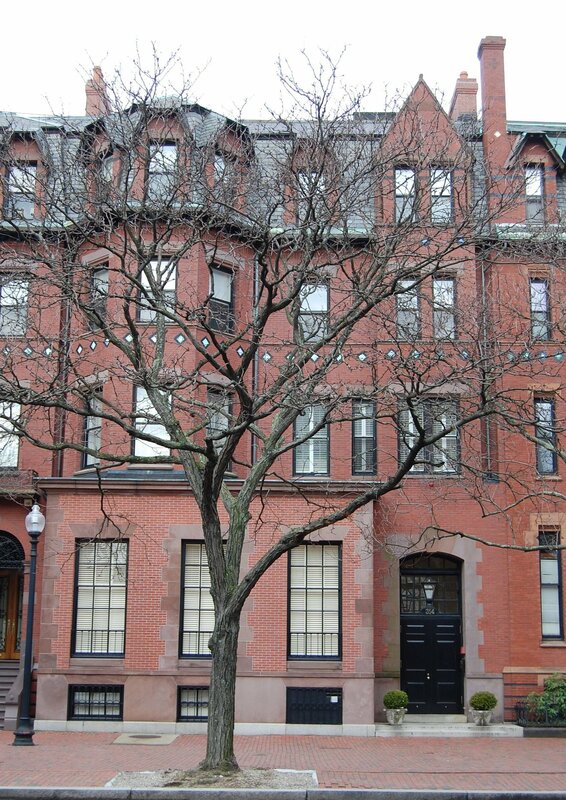 Emily Tyson and George Tyson, Jr., a banker and stockbroker, continued to live at 314 Dartmouth. By the 1918-1919 winter season, the Vaughans were living at 314 Dartmouth with George Tyson, Jr. They also retained their home in Sherborn. Emily Tyson was living elsewhere during the 1918-1919 and 1919-1920 seasons, but then resumed living there, with the Vaughans and George Tyson, Jr.
Emily Tyson died in June of 1922. The Vaughans resumed living in Sherborn and George Tyson, Jr., moved to the Hotel Kenmore. By the 1922-1923 winter season, 314 Dartmouth had become the home of attorney Pierpont Langley Stackpole and his wife, Lora (McGinley) Knowles Stackpole. They had married in May of 1922 and 314 Dartmouth probably was their first home together. Her children by her marriage to Lucius James Knowles — Lucius, Jr., and Sarah Montgomery Knowles — lived with them (Lucius James Knowles, Sr., had died in November of 1920). They continued to live at 314 Dartmouth during the 1923-1924 season, but moved soon thereafter to 53 Marlborough. On October 9, 1924, 314 Dartmouth was purchased from the Tyson estate by Barbara (Deering) Danielson, the wife of Richard Ely Danielson. They previously had lived in Groton, where they continued to maintain a home. Richard Danielson was editor and publisher of the Atlantic Monthly magazine; Barbara Stackpole was the daughter of Charles Deering, co-founder of the International Harvester Company. 314 Dartmouth was not listed in the 1924-1925 Blue Book and it appears likely that it was at this time that the house was remodeled to lower the entrance to street level and move it to the northern side of the house. The Danielsons continued to live at 314 Dartmouth in 1942. The house was shown as vacant in the 1943-1945 City Directories, but was again the Danielsons’ home in 1947. On December 27, 1948, 314 Dartmouth was purchased from Barbara Danielson by real estate dealer Henry J. O’Meara. On January 24, 1949. it was acquired by the American National Red Cross for use by their Boston Metropolitan Chapter. After interior renovations, it was opened as the Red Cross Blood Bank in June of 1949. On January 27, 1970, 314 Commonwealth was acquired from the Red Cross by the Society of Jesus of New England. They used the house for offices and a chapel. In June of 1972, the Jesuits purchased 312 Dartmouth from the Teresian Institute and used the building for a rectory with an accessory chapel.